Within the umbrella of women's fiction there are a whole host of recurring themes and one that has been particularly popular recently is the foodie novel. No matter how many books I read which describe edible delights into such delectable detail that the smell of freshly-baked goodies practically leaps off the pages, this is a scrumptious subgenre I absolutely cannot get enough of - and so I was thrilled to review another foodie fiction read; The Stall of Second Chances. The story centres on Sydney Strauss, who works as a producer on a popular television programme in Washington, D.C. Working in television sounds glamorous and exciting, but while it may be the dream job of many, it's a far departure from Sydney's true passion: food journalism. Only very occasionally she manages to pitch a food-related topic for the show that actually gets picked up and so for the most part she grunts and grumbles about her work. However, when the television station goes through a major restructuring, Sydney loses her job and she realises that while perhaps it wasn't what she dreamed of doing while in college, at least it paid her bills. Desperate to earn some money to be able to afford her rent, Sydney starts helping out at the Wild Yeast Bakery stall, which hits the local farmers' markets. Her boss 'Rick the Prick' is a shortly-fused tyrant, but at least she's earning a little cash again and at the same time she gets to spend time with her best friend Heidi who also works at the stall a few days a week. And the farmers' markets provide not only delicious produce but also plenty of yumminess of the male variety, as of course this wouldn't be a romance novel without a love interest (or two) on the scene. Surrounded by the most gorgeous fresh goods, from dozens of different types of crispy apples to the cakey goodness of Rick's almond poppy-seed muffins, Sydney is inspired to pick up her food blog again, something which she stopped updating when she and her long-time boyfriend Zach broke up. One thing leads to another and soon she is approached to write the newsletter for the farmers' market. While it doesn't pay an awful lot, just being able to do what she used to love so much is making her happier than she has been in a very long time. But when Sydney's dream job is finally within her grasp she has to make the difficult choice between work and love. I was probably a bit biased as I genuinely adore foodie fiction, but I thought this was an absolutely delightful, not to mention delicious, novel. Sydney was a wonderful main character and an inspiration to read about. After all, she goes from a high-flying job to a personal low, yet somewhere along the line she manages to turn the tables in her favour and do what she really loves, showing that it's never too late to realise your dream as long as you don't give up on yourself. Of course it didn't come easy and there were many ups and downs along the way, but that added to the realism of the story and made it gripping and unexpected until the very end. The novel is also incredibly funny (point in case the opening pages) and once Sydney starts to get back into food journalism, the descriptions of the baked delights and processes she writes about are absolutely mouth-watering – be warned that you will start craving mountains of freshly baked bread while reading this book! 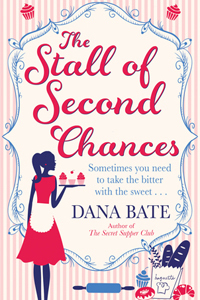 Inspirational, hilarious and delicious, The Stall of Second Chances is a tasty treat in more ways than one.